Elnora M. Harris was born in St. Louis, MO to the parents of John and Mardel Miller. At the age of 9 she heard the voice of the Lord speak to her in a dream about getting baptized. The next Sunday Elnora gave her life to Christ and was baptized with the full understanding of her commitment. About 1 year later while "playing" church with her brother John, she received the baptism of the Holy Ghost with the evidence of speaking in tongues at the young age of 10. Throughout her teenage and young adult life she was very serious about her Christian walk and was always told that she had a special calling on her life. In March 1992 she received several prophesies regarding the ministry and about her future as being a Pastor's wife. Elnora attended the University of Kansas where she received her bachelors degree in Industrial/Organizational Psychology. 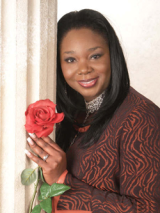 She went on to complete her Masters degree in Counseling Psychology with an emphasis in Christian Counseling from Louisiana Christian University. Elnora has devoted most of her work to serving needy families and children. She completed the Special Education Certification program at the University of Texas-El Paso. She is licensed to teach in Texas and Nevada. Elnora has worked as a Special Education Teacher and Special Education Facilitator advocating for the needs of special education students. She is studying for her Masters Degree in Educational Leadership and plans on furthering her education to obtain an Education Doctorate degree. Elnora has always had a servant's heart and has held various positions within her previous churches in St. Louis, Kansas City, Houston and El Paso. She has a love for the ministry and her desire is to see souls saved, filled with the Holy Ghost and walking in Dominion. She is married to Pastor Anthony F. Harris and is the mother of three beautiful children, Sydni, Regan and Anthony II (LA).